Adventure is calling. Soča valley. Slovenia. At this moment when i am sitting on the bed writing this article, I am thinking if maybe the antibiotics will kick inn enough for me to book another lesson of horse back riding in the next two days. Why am i explaining this? Well in horse back riding at Posestvo Blata I can say that I've found one of the loves of my life. How did I start horse back riding? I don't like to make a fuss out of my birthday, when I am asked what i want for present, the answer is usually »nothing« or "I don't know". This year it was the same as previous years, so my boyfriend was begging : »At least tell me something that you would like!«. So, I said :« ok I want a new pet or something that's connected to animals«. 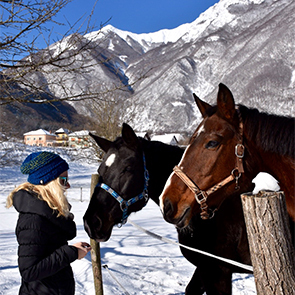 By saying that, I got a gift certificate for one hour lesson of horse back riding at Posestvo Blata in Bovec. I called Greta (founder and instructor) and made the appointment. Before the first lesson I have to say, I was quite nervous as I always considered horses amazing but at the same time i was always in awe of them. It was a Saturday morning when I came for the fist lesson. I was a bit early (a habit that I can't seem to get rid of) and Ramirano (or Rami), the horse which I was riding that day, was the first one to come and say »hi« over the fence. He seemed too big for me but Greta said he would be my partner for that day 'cause he gets on good with beginners. There are 5 more horses beside Rami at the ranch (all super friendly). Gentle Campari, who I ride the most now, courious Mercedes, who is also a master of escape as she oppenes the door by herself, Melina, the old girl who still does her work well on riding trips, Ponka, a poni that kids ride the most and Herta, a new shy girl in the family. 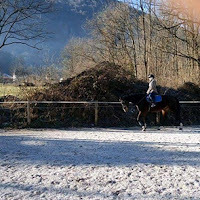 On the first day Greta showed me how to brush a horse to get the first connection, how to put on the saddle (which I forgot the moment we put it on because of all the excitement) and after I »hopped« on Rami to start the lesson. At this point I got to see that on a horse you have to balance yourself with your legs (not the arms), that you have to think of your posture (I had to sit up straight, which is not one of my habits , and that you mustn't forget how to breathe (which I, believe it or not, forgot to do a couple of times while thinking of my leg posture, my back posture and my hand posture). Let me say here that in my opinion Greta is really a great instructor – she explains all the necesary things in a way that you understand without struggling in a really calm way, she will compliment you when you are doing well and she will keep you to do one extra round even when you think that you gave everything you got already. On the first lesson I got to walk slowly for a couple of rounds to get the feeling of balance and manouvering and got to do a bit of slow running to get used to a proper technique (this was a lot tougher than I tought). An hour went by in a flash, we went back to the stables and I got to give Rami a couple of treats for a job well done. As soon as I finished I made another appointment for two days later. This time I was riding Campari (also a gentle giant as Rami). I got a whole set of equipment from Greta (from helmet to riding shoes and pants). Campari is now the horse that I have ridden the most. In the few hours that we have been riding together, we have been polishing out the proper kas – the slow running and I am proud to say that on the last lesson I have managed to do an entire circle by giving orders to Campari by my own. Also I mannaged to gallop, the faster run, but that is with Greta's help and I was holding on to the saddle. But it's a beggining =). Last summer guests and us, tourist workers, got to try out a new activity called Adventure park Srnica. Jure and Nela – a local couple and establishers had a vision about building it and in summer of 2016 they finally got to show the adventure park to the public. One of the perks abut the adventure park is definitely it's location in a remote gorge that carries the same name - Srnica. To reach it, there is about a 10 minute drive from Outdoor Galaxy office (in the centre of Bovec) to the parking place and after that a couple of minutes walk to the starting point. It is a fun group activity suitable to everyone. It is important to mention that children need to be at least 130 cm tall to go trough the entire park. Smaller children can participate only on the final part by going on the zip line with one of the adults. In the park you will experience easy hiking and also easy via ferrata climbbing trough 120 meter long gourge. As you reach the centre of the park you need to climb over steep grades and thresholds, which are protected by steel cables. You get to cross wires and log bridges to go trough the gorge, and at the end of the tour you get to slide on a zip line. The tour is always guided and it lasts around an hour. Before starting the activity, guides always help you to set up and test the safety equipment. We recommend to wear sport or hiking shoes to prevent unnecessary injuries from wearing flip flops =). If you are a nature lover, you will undoubtedly enjoy the adventure park and if you feel like exploring more after you finish with the activity, there are some amazing sceneries nearby. One of them is Gljun creek. Another one is waterfall Virje – one of the most amazing waterfalls around the area. There is also lake Plužna – an artificial lake from where you can admire Svinjak - one of the most admirable peaks around Bovec. 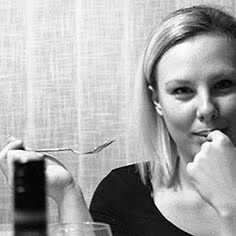 If this post has aroused interest in you, you can book a guided trip trough Srnica from March to November. Because we often say that here at Outdoor Galaxy we are all a family and not just a group of coworkers, we decided to dedicate our first article to outdoor oriented families that have decided to spend a whole outdoor holiday with us. A wide range of outdoor activities can be done in the Soca valley and it is often hard to make a selection. In the past years we hosted families and couples spending outdoor adventure holidays with us, experiencing a different outdoor activity each day. It usually goes like this. On the day of arrival we meet at our Outdoor Galaxy office to introduce ourselves, go trough your schedule for the whole week and make suggestions of what are other things to do in Soca valley along to the activities that are already planned. It is a relaxed meeting where we get to know each other. The activities you can choose from are kayaking, canyoning, rock climbing, mountain biking, rafting, hiking, caving, paragliding, zip line, horse back riding and more. As you can see there really are a lot of activities to choose from for an active outdoor holiday. discuss how was the activity from the previous day than you meet the guide for the next activity and together you go to get the equipment and to the starting point. Just before leaving Žiga – who is a multitasker in the company - makes sure that there are enough cookies for everyone in the van. All our guides share the opinion that nature is their office and love the place they work at. Beside guiding and safety of your trip they give you a tutorial of the surroundings too. This often leads to a continuing discussion even after the trip. One of the most appreciated facts about the river for example is, that you are actually paddling on drinking water, which is hard to imagine in most parts of the world. To give just a sneak peak of the activities here are some facts. On kayak trips and courses, along with explaining how to manoeuvre your kayak and how to »read« the river, our guide Janez will tell you stories about his paddling around the world, which travelers found quite exciting. On rafting trips, which are more group kind of activities, Andraž loves to take time and entertain children with some tricks he figured out. On mountain biking tours Žiga always picks the right trail adjusted to your experiences, explains facts about the area and makes sure that on hot summer days you can take a dip in the local creek or the river during the tour. On canyoning tours you can choose from 4 different canyons depending on your previous canyoning experiences. The guides always emphasise that safety comes first but they also deliver a fun and unforgettable experience. After a week of outdoor activities the vacation comes to an end. Usually our guests leave Bovec a day after the last activity. They drop by on the morning of departure to find out if all of us were at the office to give the regards - that is an amazing feeling – to see that we are able to make someone's week an week to always remember. To see what our guests say after leaving us here is just one of the reviews : »Everything from making the booking (and amendments) to saying goodbye was brilliant! Staff were amazing, helpful, friendly and accommodating. The booking of the holiday package was so flexible and pleasant - no issues. All the activities were tailor-made for our needs and wishes. Agency provided all the needed information and advice, instructors did their job admiringly well - they were patient and easy going. Soca valley is so beautiful and offers so much! It's peaceful and relaxing and at the same time active enough to keep you busy at all times. I am looking forward to coming back to Bovec!« To see more reviews visit our Trip Advisor page. And if you are looking for an idea for your next adventure visit http://www.outdoor-galaxy.com/ and book your outdoor holiday with us. We are a team of dedicated individuals from Bovec, Slovenia, who live to make adventurous holidays unforgettable. 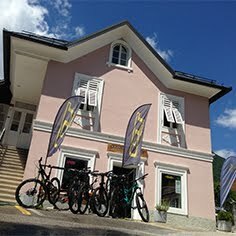 We are passionate about the outdoors and life in general and have especially one thing in common - Outdoor Galaxy - a guiding tourist agency and shop where we work and even spend our free time at, as it is one of the coolest places to be at in the whole Soča valley. Outdoor Galaxy. Picture Window theme. Powered by Blogger.